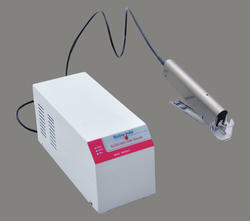 Bioline India Blood Bag Tube Sealer heavy duty and be able to seal the blood bag etc quickly and effectively. simple to handle. Gently for seal the tubing with no hemolysis using radio frequency. Sealer runs on both mains and battery (more than 10hrs back up and charger). Portable hand unit sealing hand with RF cable 1.9 meter. Easy separation of tube segments after the sealing. Electrodes are protected by a cover. Sealer runs on both mains and battery (more than 10hrs back up and charger). Back up battery and seal more than 1000 seals on PVC-tubes in continuous mode with fully charge battery. Suitable auto voltage corrector with spike protector available. Output Effect : 90W/ 50 Ohm Max. We are one of the renounced company engaged in manufacturing and supplying a wide range of Ultrasonic Cleaning Equipment. These machines are intended with fully solid state microprocessor controlled unit, digital timer and intensity display. We use of high quality raw material which not only adds durability to our products, but also makes them corrosion resistant. We are instrumental in offering excellent Annual Maintenance Services of the offered medical devices made available by our organization. These services are carried out under the supervision of our team of highly skilled engineers and technicians. They make use of different types of tools, software and equipment in order to effectively execute these services.